You Are Here: Home » Blog » auto tires » What Size Tires Does My Car Take? Famous inventor and American hero, Benjamin Franklin famously said that “in this world nothing can be said to be certain, except death and taxes.” If old Ben Franklin were still alive today he probably would’ve added that changing a car’s tires as another of life’s certainties. Cars need regular maintenance to stay in any sort of good drivable condition whether it be an oil change or changing a tire, but before you go out and buy a set of new tires it’s vital to know what size tires your car takes in the first place. So how do you find out what size tires your car takes anyway? In most cases you can find information about the size of tires your car takes in three different places on your car: on the vehicle’s driver’s side pillar, the vehicle’s manual, and on the tire itself. If you can’t find the tire size information in one of these places then you’ll most likely find it on one of the others. But the first place you should check if you want to know what size tires are standard on your vehicle is the “Tire and Loading Information” chart on the driver side pillar. This chart should be any driver’s first choice as it can usually be accessed very quickly and contains all of the information on the manufacture’s recommended tire information for your vehicle including both the front and rear tires and even the spare tire. The only issue with relying on the tire and loading information chart is if your car is outfitted with different sized tires than what is recommended by the manufacture’s such as a plus size tires. Regardless of whether you are checking the tire and loading chart or looking at your car’s tires themselves there are few things to be aware of if you want to know what size tires are right for your car. The first thing you should be on the lookout for are the letter(s) P, T, or LT, which generally follow after the tire’s name on the tire’s sidewall. Every U.S. tire will have some sort of letter designation whether they are new tires, car tires, or cheap truck tires. 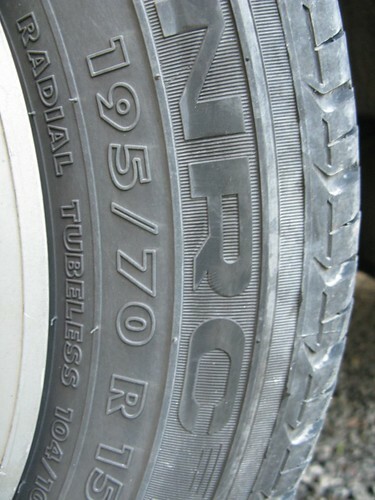 The letter(s) on the tire’s sidewall are used to indicate what and where the tire should ideally be used; tires that are designated with the letter ‘P’, for example, are passenger tires — the most widely used tires in the world, the letters ‘LT’ are used to designate a light truck tire, and lastly the letter ‘T’ by itself is reserved for temporary spare tires. Drive cautiously though or stop driving completely if your vehicle happens to be outfitted with a temporary spare tire and get try to get it replaced as soon as possible as temporary spare tires are just that, and really shouldn’t be driven on for extended periods of time. However, if you don’t see any letters indicating the tire’s service type then it’s likely that you have a European tire instead that follows ETRTO standards versus the United States’ TRA tire standards. Immediately after the letter designation indicating the tire’s size, on your tire’s sidewall will be a series of three numbers which indicate the tire’s width (in metric units) followed by slash and a two digit number that indicates the tire’s aspect ratio. And following the tire’s aspect ratio number will be the letter B, R, or D indicating that the tire is a a bias belt, radial, or diagonal tire respectively. Lastly, there will be a 2 or 3 digit number that is used to indicate the tire’s load index. Therefore a full tire code that you could expect to see on a tire’s sidewall would be something like P205/60R15. In some cases when someone asks “What size tires does my car take”, what they really mean to say is “What size tires will my car accommodate?” While the two questions may seem similar they in fact have two different meanings. Asking what size tires your car will take usually implies that you are planning on replacing your vehicle’s current tires with a set of tires of identical size; however, asking what size tires will my car accommodate implies that a person is looking to replace their vehicle’s current size tires with either plus size or smaller tires. So if your goal is to find out what plus size tires can fit on your car then by all means check out our convenient information on plus size tires and our stock of plus size tires. Most cars have enough remove to accommodate a plus one tire or more, but if you need more detailed information then just select your vehicle’s year, make, and model from our top menu choice that reads “Buy Wheels Online”. Like most things in life it all comes down to a matter of preference. But if you happen to be in the market for new tires now than just check out our sale of kelly tires.